Take time out from the rides to watch the flawlessly choreographed parade. It took a Disney-sized slice of Americana ‘Nipponified’ to show Jen Pinkerton the essential innocence and beauty at the heart of travelling in Japan. It’s 9am on a mid-week morning and rivers of Disney fans flow towards Mecca. Teenage girls wear hairdos the shape of mouse ears. Toddlers dress as queens. Grown men carry backpacks cloaked with clip-on toys. 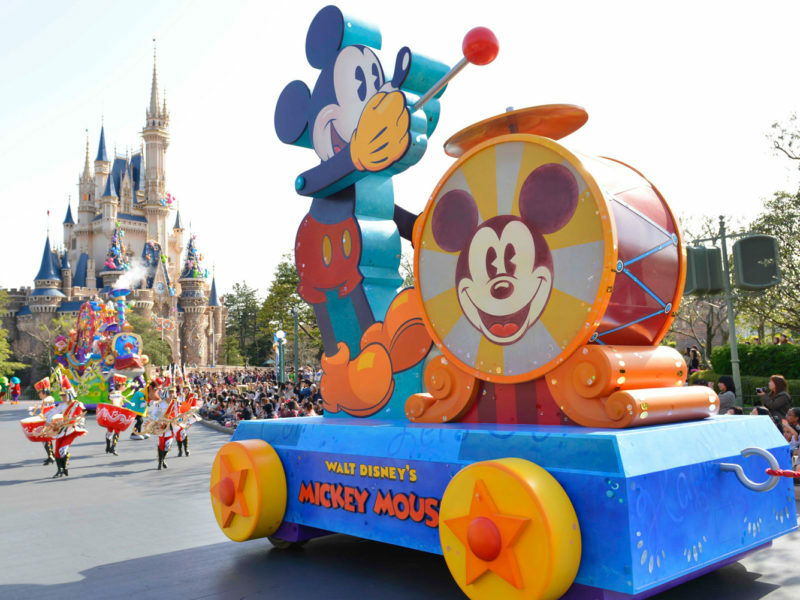 In short, all paths leading to Tokyo Disneyland are a stage. And against this crowd, even in my fluro-flecked frock, I look as dull as a doorknob. A precautionary email from a friend pops into my head. “It’s normal to queue at the Disneyland entrance for a couple of hours so GET THERE EARLY.” I hadn’t taken the tip. But with Zip-A-Dee-Do-Dah floating from nearby speakers, and all these people to watch, who needs rides? Let me confess: in the lead up to this moment I’d been a little nonchalant. I was excited about Japan, but Disneyland? I’d seen the Los Angeles version as an 11-year-old with an overbite and a nose for bad tracksuits. Sure, I loved it. But I was a kid. Twenty years later, singing animals have somewhat lost their sheen. Plus, in my view, travel is about hunting out what makes a country different, not about judging how well it does Americana. Preconceptions aside, there must be something about the place. It’s popular. And when I say popular, I mean it’s The Most Visited Site in Japan. Along with add-on DisneySea, Disneyland elbows out tourist rivals such as Tokyo’s temples and its quirky epicentre, the suburb of Harujuku. The theme parks have 18,000 staff on their books. Together they draw an annual visitor crowd of 27 million – 96 per cent of whom are Japanese. Now at the starting gate, this foreign visitor passes ‘go’. I emerge inside a giant green house: a glass-roofed structure filled with lantern-lit streets, Parisian-style cafés and oddball ‘cast members’ such as a bicycle-riding piano player. In the distance I make out the Sleeping Beauty Castle. It’s swaddled in early morning haze. This is quite the magical entry. And a quiet one, too. The recently revamped Star Tours ride – commentary in Japanese. That’s the first thing you notice about Tokyo Disneyland. Boisterous it ain’t. Disney songs softly spill into the park. People queue patiently. For a place teeming with visitors, it’s markedly hushed – a trait that pervades Japan as a whole. First things first, I try the recently revamped Star Tours ride, which is a bit like an intimate IMAX theatre with shifting seats. We spin through galaxies on a spaceship and watch Chewbacca claw at our ship, leaving a trail of oily paw prints on the windscreen. The commentary is all in Japanese, but it doesn’t seem to matter. From there we hit the vividly lit It’s a Small World, then Space Mountain. While kids go bananas over the former, it’s Space Mountain that sends me into high gear. I start to feel like I imagine an addict might. After minutes spent hurtling through darkness, kept company only by tiny lights and minimalist techno, something snaps in my brain. I’m reconnected with that tracksuit-clad 11-year-old. I feel slightly nauseous, yet completely hooked. Briefly, I forget I’m in Japan. In my best Darth Vader voice, three words rise from my throat: “I. Want. More.” High adrenalin rides need only apply. Tower of Terror, Indiana Jones Adventure and Splash Mountain all make the cut. Come mid-afternoon, however, these old bones need a rest. There’s a daily 3pm parade and it’s worth a watch. It feels like a scene you’d see at an Olympic Games opening ceremony. Think giant floats, great costumes and ample licks of make-up. I wander by the Sleeping Beauty Castle to take up a viewing spot in the Wild West at Westernland. As I do, chimes sound from the garden. Nice touch, I think. It’s among the many small devices that help reset visitors’ moods – psychologically immersing them in whichever ‘theme’ they’re amidst, be it a magic garden, tropical jungle or haunted house. She’s right. Sure you could grumble about the long waits for rides and the odd spot of cheesiness, but essentially Tokyo Disneyland captures something mercurial: our imaginations. It also throws in a good dose of surprise. Take the bicycle piano, for instance, or a 12-piece marching band that springs into action around midday. Disney is ‘on brand’ regardless of the destination. But more enticingly, for me at least, this Disneyland visit doesn’t just glean its value from the cleverness of the park. It comes from the way in which the attraction stands apart from its American mould. It’s the Japanese-ness. And that includes how much the people here adore all things Disney. 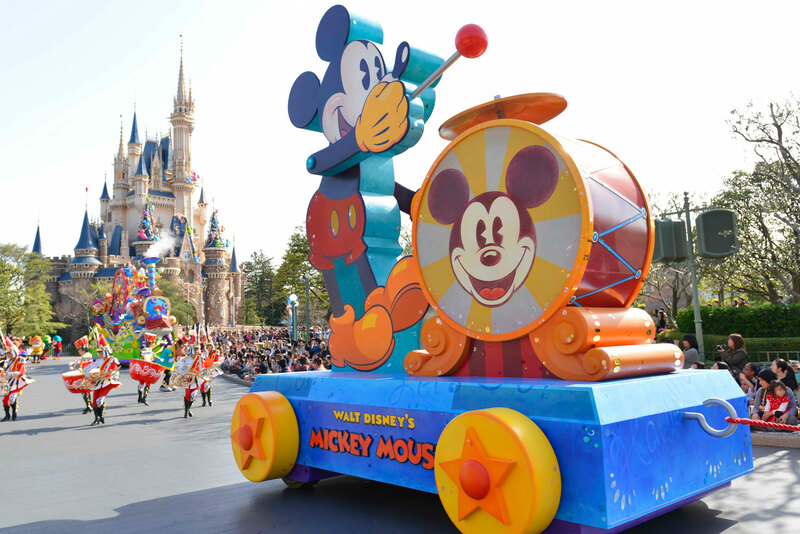 There’s a childlike innocence to Disneyland – and indeed to much of Japan. The park dunks you headfirst in fantasy. It also gives visitors license to dress up and unleash their inner crazy (in a loud-but-oh-so-quiet Japanese way). My own attire might not measure up, but as this fluro-flecked dress exits after dark, I’ll be darned if Disney songs haven’t looped into my thoughts semi-permanently. Zip-a-Dee-Do-Dah accompanies me while I ride the elevator, turn the room key and brush my teeth. In the mirror I can’t help noticing my overbite. Had it popped back for the night, just to remind me I was once 11? More likely, I think, as I drop into bed, the overbite – and the bad tracksuits for that matter – never really left. Even grown males are captured by the Disney ‘magic’.